And the Pentagon wants to send even more to the country. Consider this recent headline: “US to Ship 2,000 Anti-Tank Missiles To Iraq To Help Fight ISIS.” The accompanying article describes a Pentagon initiative to reinforce Iraq’s battered army with a rush order of AT-4s. A souped-up version of the old bazooka, the AT-4 is designed to punch holes through armored vehicles. Taken on its own terms, the decision makes considerable sense. Iraqi forces need something to counter a fearsome new tactic of the Islamic State of Iraq and Syria (ISIS): suicide bombers mounted in heavily armored wheeled vehicles. Improved antitank capabilities certainly could help Iraqi troops take out such bombers before they reach their intended targets. The logic is airtight. The sooner these weapons get into the hands of Iraqi personnel, the better for them—and so the better for us. 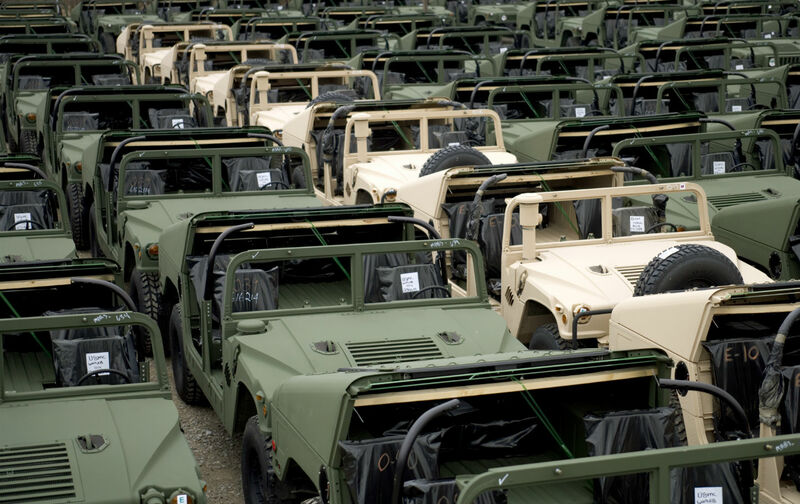 As US forces were themselves withdrawing from Iraq in 2011, they bequeathed a huge fleet of Humvees to the “new” Iraqi army it had built to the tune of $25 billion. Again, the logic of doing so was impeccable: Iraqi troops needed equipment; shipping used Humvees back to the US was going to cost more than they were worth. Better to give them to those who could put them to good use. Who could quarrel with that? Before they handed over the used equipment, US troops had spent years trying to pacify Iraq, where order had pretty much collapsed after the invasion of 2003. American troops in Iraq had plenty of tanks and other heavy equipment, but once the country fell into insurgency and civil war, patrolling Iraqi cities required something akin to a hopped-up cop car. The readily available Humvee filled the bill. When it turned out that troops driving around in what was essentially an oversized jeep were vulnerable to sniper fire and roadside bombs, “hardening” those vehicles to protect the occupants became a no-brainer—as even Secretary of Defense Donald Rumsfeld eventually recognized. At each step along the way, the decisions made possessed a certain obvious logic. It’s only when you get to the end—giving Iraqis American-made weapons to destroy specially hardened American-made military vehicles previously provided to those same Iraqis—that the strangely circular and seriously cuckoo Alice-in-Wonderland nature of the entire enterprise becomes apparent. AT-4s blowing up those Humvees—with fingers crossed that the anti-tank weapons don’t also fall into the hands of ISIS militants—illustrates in microcosm the larger madness of Washington’s policies concealed by the superficial logic of each immediate situation. Washington is a city in which whatever happens within the current news cycle trumps all other considerations, whether in the immediate or distant past. So the moderator launched the discussion by asking the panelists to comment on President Obama’s decision, announced earlier that very day, to plus-up the 3,000-strong train-and-equip mission to Iraq with an additional 450 American soldiers, the latest ratcheting up of ongoing US efforts to deal with ISIS. For her part, Flournoy thought the real problem was “making sure that there is Iraqi capacity to hold the territory, secure it long-term, so that ISIS doesn’t come back again. And that involves the larger political compromises”—the ones the Iraqis themselves needed to make. At the end of the day, the solution was an Iraqi army willing and able to fight and an Iraqi government willing and able to govern effectively. On that score, there was much work to be done. To participate in an exchange with these pillars of the Washington establishment was immensely instructive. Only nominally did their comments qualify as a debate. Despite superficial differences, the discussion was actually an exercise in affirming the theology of American national security—those essential matters of faith that define continuities of policy in Washington, whatever administration is in power. That ISIS represents something akin to an existential threat to the United States, the latest in a long line going back to the totalitarian ideologies of the last century; fascism and communism may be gone, but danger is ever present. That if the United States doesn’t claim ownership of the problem of Iraq, the prospects of “solving” it are nil; action or inaction by Washington alone, that is, determines the fate of the planet. That the exercise of leadership implies, and indeed requires, employing armed might; without a willingness to loose military power, global leadership is inconceivable. ISIS would not exist were it not for the folly of the United States in invading—and breaking—Iraq in the first place; we created the vacuum that ISIS is now attempting to fill. US military efforts to pacify occupied Iraq from 2003 to 2011 succeeded only in creating a decent interval for the United States to withdraw without having to admit to outright defeat; in no sense did “our” Iraq War end in anything remotely approximating victory, despite the already forgotten loss of thousands of American lives and the expenditure of trillions of dollars. For more than a decade and at very considerable expense, the United States has been attempting to create an Iraqi government that governs and an Iraqi army that fights; the results of those efforts speak for themselves: They have failed abysmally. Now, these are facts. Acknowledging them might suggest a further conclusion: that anyone proposing ways for Washington to put things right in Iraq ought to display a certain sense of humility. The implications of those facts—behind which lies a policy failure of epic proportions—might even provide the basis for an interesting discussion on national television. But that would assume a willingness to engage in serious self-reflection. This, the culture of Washington does not encourage, especially on matters related to basic national security policy.